1. 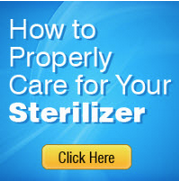 What are portable self-contained sterilizers good for? Media and other liquid preparations. Decontamination of waste As a dedicated unit for a particular purpose. BSL level III labs where technician's access is limited and therefore reliability is imperative Locations for which there is no autoclaving facilities Sterilize general laboratory wares where a dry cycle is not necessary Start-up companies with little investment money. 2. Almost any wet lab can use a Tomy Autoclave. Your biggest problem is that most labs have access to a centralized autoclave service or facility that can sterilize a Jeep if they need to. That makes having an autoclave inside the laboratory a very low priority. Most often, people will turn to Tomy when they don't have access to such a facility, when the facility is old and unreliable or if they don't have the money to set one up. 3. Why is vertical important? Unlike dentists or tatoo parlors, the laboratory has a wide of variety of objects that need to be autoclaved prior to use. The vertical clearance is especially helpul for tall flasks and beakers. Tomy ES-215 and ES-315 Autoclaves with Delayed Start Timer and Warming Cycle are completely self-contained, compact, and portable. They roll right to your work bench to give you fast, effective sterilization of media, glassware, instruments, and disposables - on the spot and on your schedule. The ES Series Autoclaves also feature three cycle of operation and Graphic Process Display. Operation is very easy. Just select the cycle and set the temperature and time. The rest is automatic. A graphic display and audible alarm let you know the process and completion of the operation. The ES-215 and ES-315 Autoclaves provide convenient processing of your laboratory sterilization and media preparation needs. 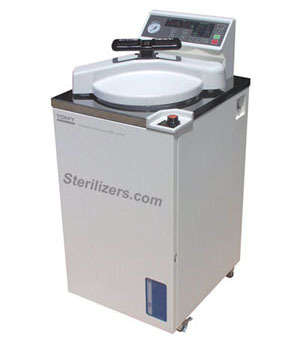 These functional autoclaves offer three cycles of operation ranging from basic sterilization cycles to automatic warming cycles. The eight hour warming cycle featured in the Tomy ES Series Autoclaves may be used directly following a sterilization cycle or independently to melt and keep sterile media ready for use. To increase your convenience, these cycles may be programmed up to 99 hours in advance using the Delayed Start Timer. This feature enables you to have sterile media on hand and ready for use when you need it. Tomy Autoclaves also spare you the initial installation costs associated with the plumbing and hard wiring of conventional autoclaves because they are portable. Just plug in the power cord, add water, and let the self-contained steam generator and venting system do the rest. Tomy's vertical loading autoclaves accommodate a wide range of items. Small items like petrie dishes and test tubes are easily accommodated in the stacking baskets while large items like a fermenter or a 25 liter carboy may are also available for sterilizing liquids. To ensure your safety and complete sterilization, Tomy Autoclaves are equipped with independent temperature and pressure monitoring system.